The purely cellular avascular layer covering all free surfaces, cutaneous, mucous, and serous, including the glands and other structures derived therefrom. /ep·i·the·li·um/ (-the´le-um) pl. epithe´lia [Gr.] the cellular covering of internal and external body surfaces, including the lining of vessels and small cavities. It consists of cells joined by small amounts of cementing substances and is classified according to the number of layers and the shape of the cells. ciliated epithelium that bearing vibratile cilia on the free surface. columnar epithelium that composed of columnar cells. cuboidal epithelium that composed of cuboidal cells. olfactory epithelium pseudostratified epithelium lining the olfactory region of the nasal cavity and containing the receptors for the sense of smell. 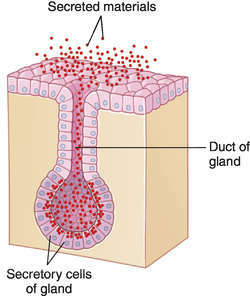 Schematic diagram of the receptors in the olfactory epithelium. pseudostratified epithelium a type that looks stratified but is not, because its cells are arranged with their nuclei at different levels. seminiferous epithelium stratified epithelium lining the seminiferous tubules of the testis. squamous epithelium that composed of squamous cells. stratified epithelium that composed of cells arranged in layers. transitional epithelium that characteristically found lining hollow organs that are subject to great mechanical change due to contraction and distention; originally thought to represent a transition between stratified squamous and columnar epithelium. the covering of the internal and external organs of the body and the lining of vessels, body cavities, glands, and organs. It consists of cells bound together by connective material and varies in the number of layers and the kinds of cells. The stratified squamous epithelium of the epidermis comprises five different cellular layers. epithelial, adj. The purely cellular avascular layer covering all the free surfaces, cutaneous, mucous, and serous, including the glands and other structures derived therefrom. Epithelium with hairlike processes on the surface that wave actively only in one direction. This type is present in the respiratory tract and fallopian tubes. Epithelium composed of cylindrical cells. Epithelium consisting of cube-shaped or prismatic cells with height about equal to their width. 1. Epithelium that covers the surface of the genital ridge of the urogenital folds of an embryo. It gives rise to the seminiferous tubules of the testes and the surface layer of the ovary. It was once thought to produce the germ cells (spermatozoa and ova). 2. The epithelium that covers the surface of a mature mammalian ovary. Epithelium consisting of secretory cells. Squamous epithelium that lines the subarachnoid and subdural cavities, the chambers of the eye, and the perilymphatic spaces of the ear. Epithelium consisting of flat, platelike cells in a single layer. Epithelium in which the bases of cells rest on the basement membrane but the distal ends of some do not reach the surface. Their nuclei lie at different levels, giving the appearance of stratification. Combined epithelial layers of the enamel organ, which form a protective layer over the enamel crown as it erupts and then become the primary epithelial attachment surrounding the tooth. The flat form of epithelial cells. The nonkeratinized epithelium that lines the gingival sulcus. A form of stratified epithelium in which the cuboidal cells adjust to mechanical changes such as stretching and recoiling. This type of tissue is found only in the urinary system (renal pelvis, ureter, bladder, and a part of the urethra). The non-stick coating cell layer for all surfaces of the body except the insides of blood and lymph vessels. Epithelium may be single-layered, or ‘stratified’ and in several layers, with the cells becoming flatter and more scaly towards the surface, as in the skin. It may be covered with fine wafting hair-like structures (cilia), as in the respiratory tract, and it may contain mucus-secreting ‘goblet’ cells. See also ENDOTHELIUM and EPIDERMIS. Fig. 153 Epithelium (1) . Types of epithelium. (in animals) a layer of covering cells lying on a basement membrane that is called simple epithelium when one cell thick and compound epithelium when several cells thick, and usually covers connective tissue embryologically derived from the ECTODERM. The cells sometimes have a secretory function and are held together by a cementing substance to form a sheet. Their shape gives rise to names descriptive of the cells, e.g. columnar, cubical, squamous (see Fig. 153 ). Where the epithelium is more than one cell thick it is described as stratified. Similar cells can be derived from MESODERM and are referred to as mesothelium when lining the COELOM, and as ENDOTHELIUM when lining blood vessels. (in plants) a layer of cells lining cavities and secretory canals, for example, resin canals. Cells composing the lining of an organ. 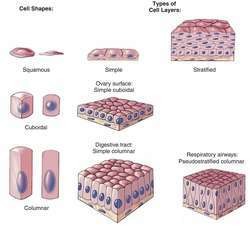 n the layer of cells that lines a body cavity; cells may be ciliated or unciliated, and may be squamous (flat, scalelike), cuboidal (cube-shaped), or columnar (column-shaped). n an electronmicroscopic finding of intercellular bridges that serve to attach adjacent epithelial cells to each other. n the innermost layer of cells (ameloblasts) of the enamel organ that deposit the organic matrix of the enamel on the crown of the developing tooth. Also the innermost layer of Hertwig's epithelial root sheath. n the outermost layer of cells of the enamel organ. It is separated from the inner enamel epithelium in the area of the developing crown by the stratum intermedium and stellate reticulum and lies immediately adjacent to the inner enamel epithelium in the area of the developing root. n a stratified squamous epithelium consisting of a basal layer; it is keratinized or parakeratinized. n an increase in thickness, with alterations in structure, produced by proliferation of cellular elements of epithelium. n the epithelial covering of the oral mucosa. Composed of stratified squamous epithelium of varying thickness and varying degrees of keratinization. n the epithelium that lines the periodontal pocket. Its most prominent characteristics are the presence of hyperplasia and ulceration. n a type of epithelium in which there appears to be several layers (or strata) of cells, but all cells actually are resting on the base layer. Often ciliated and occurs only in mucosa. n a type of epithelium consisting of flat, scalelike cells. n the variety of epithelium covering the oral mucosa and dermal surfaces; composed of layers of cells oriented parallel to the surface. The various layers of cells in order from basement membrane to surface are stratum germinativum, stratum spinosum (prickle cell layer), and stratum lucidum (in dermal epithelium). The gingival epithelium generally exhibits some degree of keratinization, variable from parakeratinization to orthokeratinization within the layers of the stratum granulosum (granular layer) and stratum corneum (keratin layer). n the stratified squamous epithelium forming the covering of the soft tissue wall of the gingival sulcus, or crevice. Extends from the gingival margin to the line of attachment of the epithelium to the tooth surface. Columnar epithelial cells surrounding the ulcer were swollen and contained dense, eosinophilic, cytoplasmic granules of various sizes that suggested Guarnieri-like inclusions. A unilocular or oligolocular lesion that contains mucin and is lined by columnar epithelial cells is consistent with a cystic mucinous neoplasm, which is more likely to be malignant. The luminal surface area of columnar epithelial cells was estimated by measuring the cell diameters of luminal plasma membranes from scanning electron micrographs. 1) The ameloblastic cells are columnar epithelial cells palisaded about the periphery of the tumor nests, with a subnuclear vacuolization away from the basement membrane. Columnar epithelial cells were generally eosinophilic. The thin outer layer of squamous cells devoid of nurse cells becomes thicker, consisting of columnar epithelial cells and large numbers of interstitial cells [ILLUSTRATION FOR FIGURES 27 AND 28 OMITTED].